Summary: Kira, Samm, and Marcus fight to prevent a final war between Partials and humans in the gripping final installment in the Partials Sequence, a series that combines the thrilling action of The Hunger Games with the provocative themes of Blade Runner and The Stand. Review: The final book of the Partials Sequence had everything I hoped it would: lots of people being clever, a strong command of multiple plotlines and POVs, philosophical discussions about what it means to be human, great action sequences, and lots of death. (At one point, I thought Dan Wells wouldn’t dare and then I immediately thought Of course he would, and then he did, and I was both thrilled and filled with despair.) I adored the opening chapter—the Partials’ relentless hunt for Kira and their attempt to force the other humans to give her up was chilling and set the mood for the rest of the book. 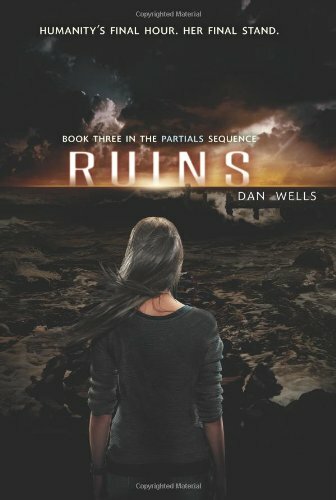 There is a lot going on in Ruins, and Wells did an excellent job of following a ridiculous number of plotlines and characters without making the book feel disjointed. Most of the plotlines had been set up nicely in the previous book, but there were also a few mysteries and surprises that popped up. (Some were better executed than others. I’m still not certain what to think about the Blood Man thing. From a thematic and loose-ends-tying perspective, he was absolutely necessary, but he seemed to come out of nowhere for me, and not always in a good way.) The different POVs were much stronger in Ruins than in Fragments, and I especially enjoyed Ariel and her near-all-consuming rage toward Nandita. I wish we could have spent more time with her. Kira was, as she has been through the series, an intelligent, capable narrator. I often have to suspend my disbelief when teenagers become leaders despite there being capable adults on the same side (mostly because I doubt the adults’ ability to acknowledge the teenagers’ competence and to trust them), but Kira’s growth into one of the leaders of the last remnants of humanity was believable as it was heartbreaking. She was one of the rare humans who still pushed for and believed in a solution that did not involve mutually assured destruction, and she refused to give up. More importantly, she refused to make the same kind of awful “it doesn’t matter what happens so long as there are survivors” choices that many of the adults around her made. There was a great moment early in the book where Kira decides that what’s more important than survival is that the humans and the Partials are still worth saving. I loved her for that, and that was the moment where I began to believe she was the kind of leader that the rest of humanity could follow. Samm and Marcus were also great narrators. (Marcus, in particular, was hilarious. Was he this funny in the previous books?) I really enjoyed how quiet, almost reflective, Samm’s POV was. He got to do a lot of thinking in this book and puzzle-solving/theory confirming, and it was a great reminder that even though the Partials were created for war, they were more than just sentient killing machines. He came through as a much stronger personality in this book, and his interactions with Heron were especially interesting. The romance was still delightfully understated, and I adored how honest and open Kira was about her confused feelings re: Samm and Marcus. (I may or may not have done a little fist-pump when she outright acknowledged that while she’d like to get things sorted out, they had people to save, and romance could be shelved until a more appropriate time.) Both boys never made her feelings about them or succumbed to petty jealousy or shamed her for her choices. Recommendation: Buy it now. Wells has created a series where the end-of-the-world stakes actually feel appropriately apocalyptic and populated it with characters you can root for. The characters explore all sorts of important questions when it comes to the morality of survival without giving us easy answers, and their struggles are complicated and fascinating. While I had a few minor issues with particular plotlines, the book is a spectacular end to the Partials Sequence.